Music therapy is an effective intervention for working with traumatized children and adults. It helps reduce anxiety, offers emotional relief, and facilitates life-affirming social interactions, to name just a few of its benefits. The purpose of this article is to shed light on how music therapy addresses trauma for anyone interested in a music career that truly changes lives. Music therapists have been called upon to support the recovery of individuals and communities following horrific events as well as natural disasters. Settings have included New York City metropolitan area after the 9/11 terrorist attacks; New Orleans after Hurricane Katrina; Umpqua Community College after a mass shooting on campus; various war- and post-war zones; and other disaster recovery situations. Borling brought his skills as a music therapist to Newtown, Connecticut where a 2012 shooting at Sandy Hook Elementary School took the lives of 20 children and six staff members, and to Virginia Tech (Virginia Polytechnic Institute and State University) after a campus shooting in 2007 killed 32 and injured many others. Music therapy also serves those who’ve experienced trauma as a result of chronic pain, chemical addiction, child abuse, asylum-seeking, domestic violence, incarceration, and other sources of emotional distress. • Janice Lindstrom, a visiting lecturer in Music Therapy at SMU Meadows School of the Arts, has utilized music therapy with abused children and with patients at Veterans Administration hospitals. She has also applied music therapy to her work with the International Rescue Committee (IRC) to support individuals around the world who are affected by war and natural disasters. • Kimberly Sena Moore, clinical training director of Music Therapy at the Frost School of Music at University of Miami, is researching the impact of music therapy on the emotional self-regulation of children with a history of trauma. Emotional regulation refers to the ability to effectively manage and respond to emotional experiences. • Ron Borczon, director of Music Therapy at California State University, Northridge, worked with the therapists of family members and survivors of the 1995 Oklahoma City bombing as well as with school-age children who experienced the 1994 earthquake in Northridge, California. He also helped in planning music therapy interventions after shootings at Columbine High School in Littleton, Colorado and Santee High School near San Diego, California. • Yasmine Iliya, adjunct faculty at Saint Mary-of-the-Woods College, New York University and Molloy College, is working on a pilot program using music therapy with Syrian refugee children in Jordan. • Jessica Cole-Robinette uses music therapy with patients at Akron Children’s Hospital’s Palliative Care Program. She has also used music therapy with victims rescued from human trafficking; homeless veterans; and those dealing with medical trauma within the family. Joanne Loewy, director of New York City’s Mount Sinai Beth Israel’s Louis Armstrong Center for Music & Medicine, has found music therapy to be a vital intervention for premature infants in neonatal intensive care units (NICU). 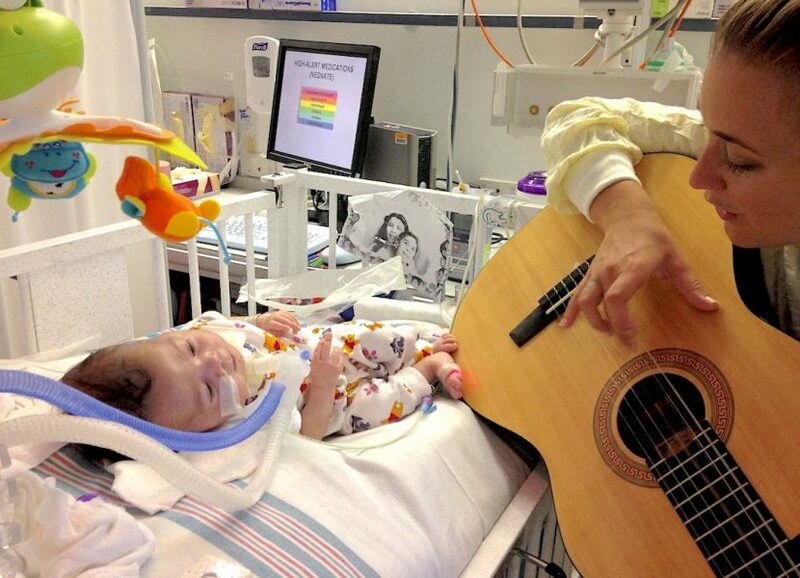 Loewy’s research shows that singing to infants in the NICU increases their alertness. She developed a rhythm technique in conjunction with the Remo drum company, using a small two-toned wooden “gato” box to mimic the heartbeat of the infants’ mothers. She also worked with Remo to develop the Lullaby Ocean Disc to imitate the missing whooshing sounds of the womb. The Disc has been shown to slow and regulate the breathing of premature infants whose lungs are not yet fully developed. It has also been effective at reducing stress and facilitating sleep. Parents are taught how to use these techniques in order to feel more engaged with their premature infants and to be able to continue working with these interventions when their babies are ready to go home. Loewy has also shown that music therapy is an effective intervention with children suffering from a number of problems including cancer, diabetes, asthma, eating disorders, suicidal tendencies, and emotional distress. Songwriting and improvisation are two of the most common ways music therapy addresses trauma. • Andrew Knight, assistant professor of Music Therapy at Colorado State University, says that music therapists incorporate “song lyrics, musical elements, and metaphors/analogies” that can help clients gain new insights to help them move through difficult problems. “Composition includes songwriting as a way to express oneself in a musical medium,” he says. • Cathy H. McKinney, coordinator of Music Therapy at the Hayes School of Music at Appalachian State University utilizes the Bonny Method of Guided Imagery and Music (see sidebar) to help clients recover from trauma. Through the Bonny Method, images are brought to mind to assist clients in working through trauma and related unresolved issues. Undergraduate music therapy programs do not focus on working with traumatized populations. Those drawn to this area of concentration gain some of the necessary training through their required supervised internship. Many enter graduate programs in music therapy for additional clinical skills and further training. Others seek a degree in a relevant area of counseling. Continuing education is an important part of the professional life of a music therapist. Training and support are available through workshops, seminars, and publications offered by the American Music Therapy Association. The World Federation of Music Therapy is another resource for continuing education. Christenbury adds, “We must learn more about the cultures of our clients to better understand, serve, and sympathize/empathize with them before pursuing our own therapeutic agendas.” Music therapists need to be aware that trauma manifests for different people in different ways, she says, including anger, withdrawal, sexual acting out, and addictive behaviors. “Being open and accepting of each person’s journey, religious beliefs, views of humanity –– especially if they are different from one’s own” is essential. “Being patient; trusting the process of healing; and going at the client’s pace” – these are all important when working with traumatized clients. Thank you. Well resourced, broad and comprehensive. This is an important field and we must continue to take care of ourselves and each other as we proceed.